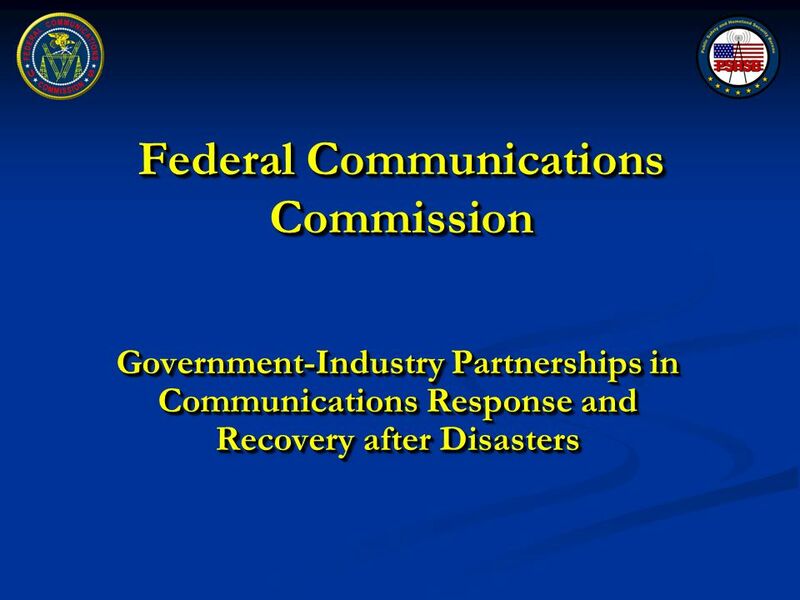 National Communications System (NCS) Government – Industry Partnership in Emergency Communications Response November 16, 2011 Jeffrey Glick Chief, Critical. 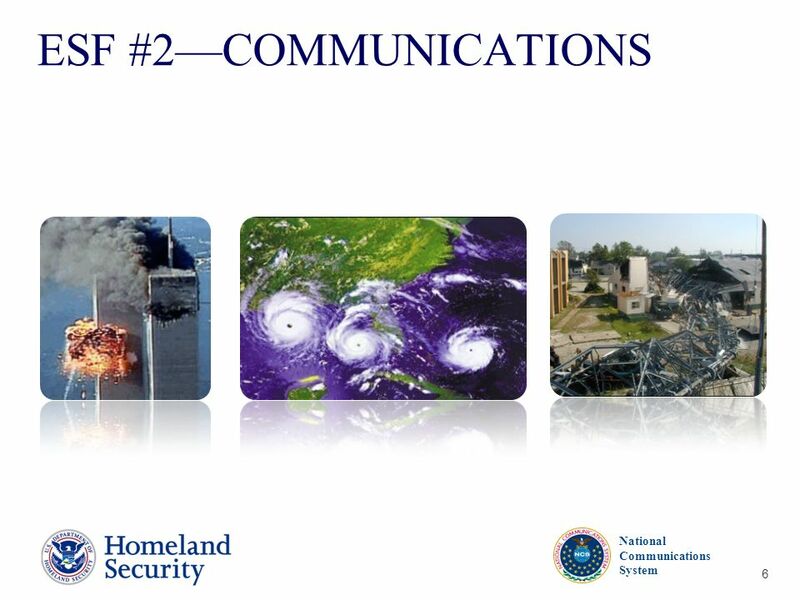 3 NCS Mission Assist the President, the National Security Council, the Director of the Office of Science and Technology Policy and the Director of the Office of Management and Budget in the exercise of telecommunications functions and responsibilities, coordination of the planning for and provision of National Security and Emergency Preparedness (NS/EP) communications for the Federal government under all circumstances This is not the official NCS mission statement – so we need to either write it verbatim or present this differently. 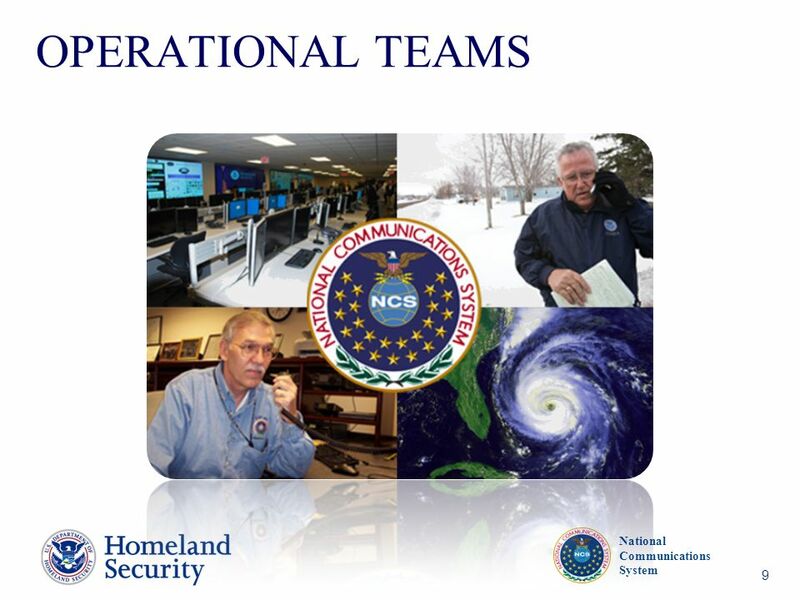 Identifying and staging resources Identification of staging locations Portable Generators COWs/COLTS, SatCOLTs Fuel vendors contacted Generators pre-fueled Equipment and spares Deployment of additional capacity and backup power to high priority sites Major thoroughfares/evacuation routes Public Safety location High priority locations ACCESS - FUEL - SECURITY The event has been tracked and we have the benefit of foreknowledge to plan and take action to prepare for landfall. 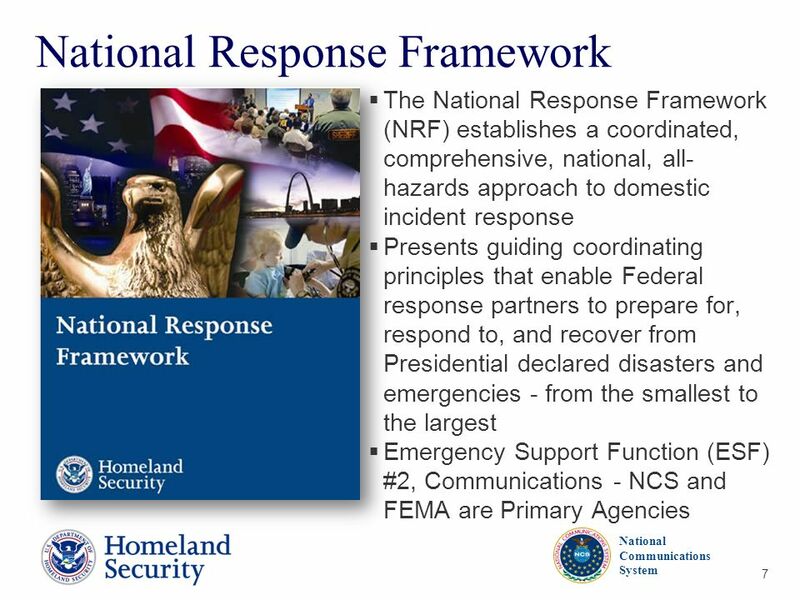 Resources – staff, fuel, equipment – are engaged to prepare. 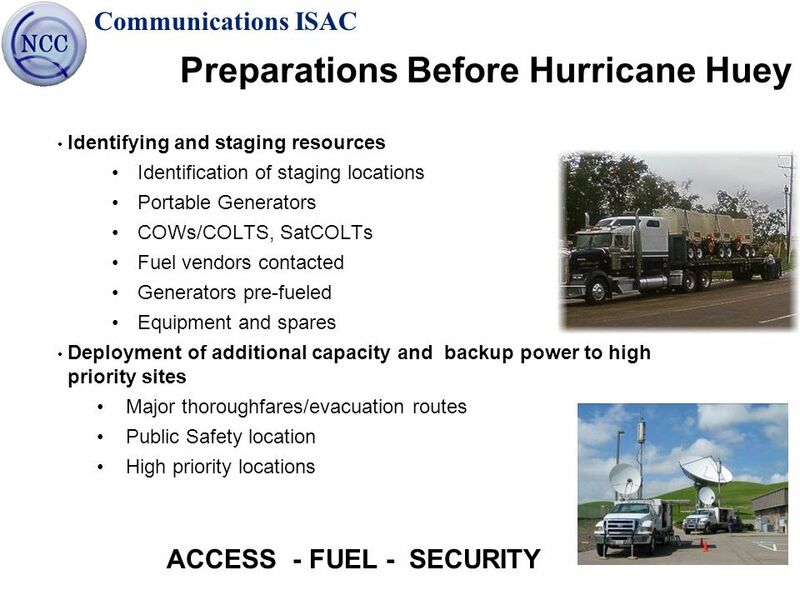 Generators and trucks are topped off with fuel. Go Kits are checked. 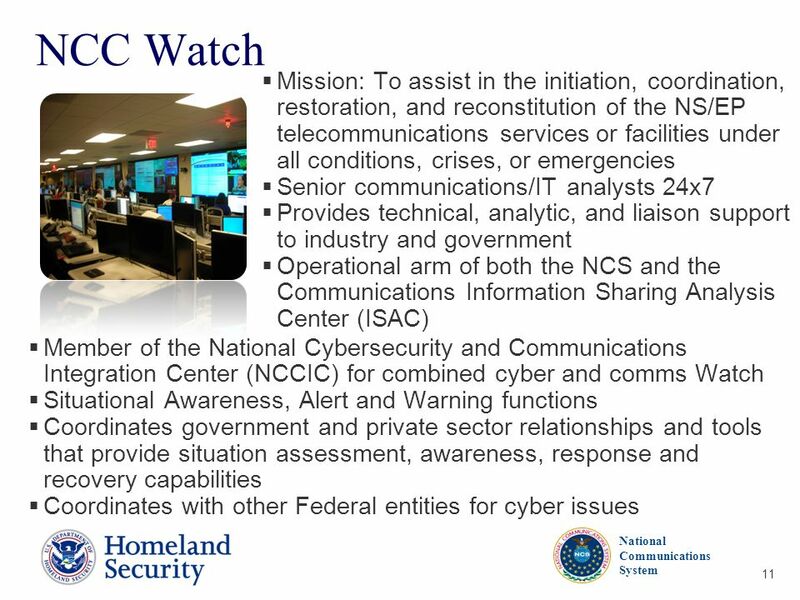 GOVERNMENT CAN HELP ACCESS REQUIREMENT What information do we need to prepare work letters, ID required, etc. 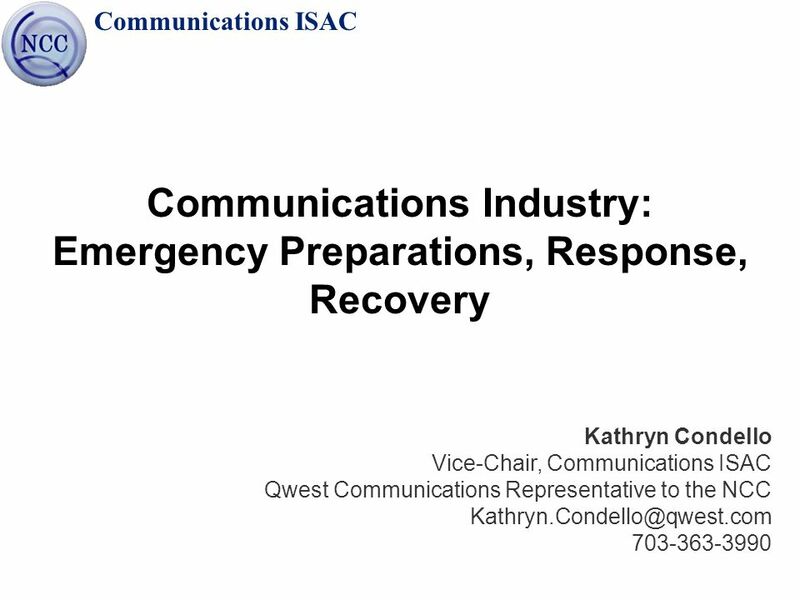 Prepared in advance can save valuable time for restoration. 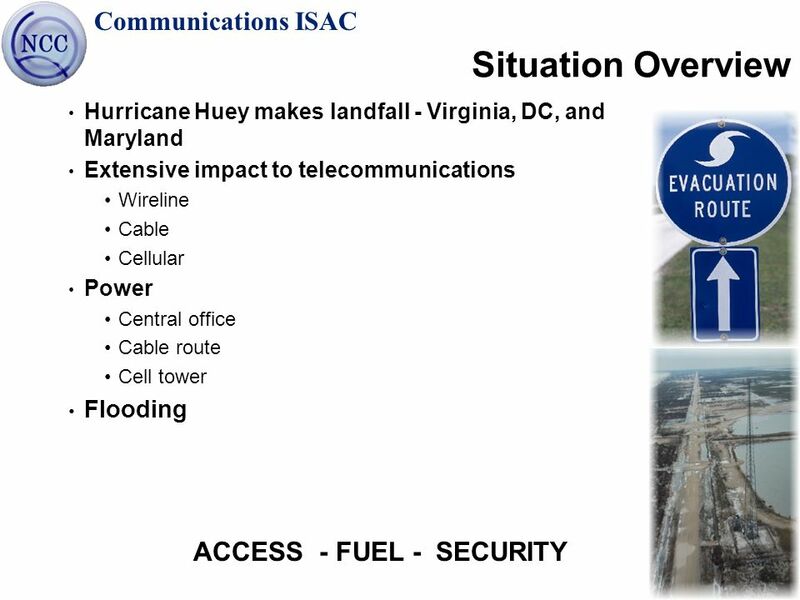 Situation Overview Hurricane Huey makes landfall - Virginia, DC, and Maryland Extensive impact to telecommunications Wireline Cable Cellular Power Central office Cable route Cell tower Flooding ACCESS - FUEL - SECURITY Initial damage sustained – Physical damage to facilities and structures Circuit outages Power outages Impact will grow over the first few days then begin to subside as restoration of power and infrastructure proceed. 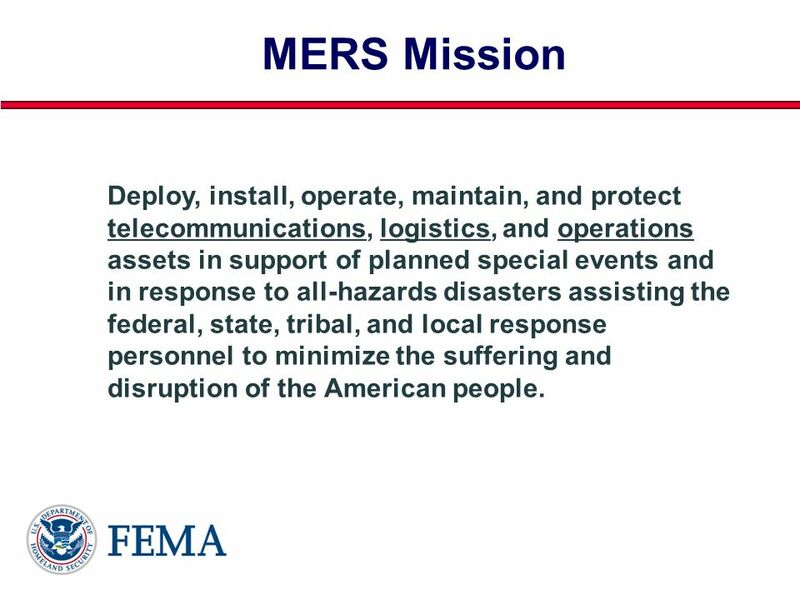 Flooding of low lying areas will impact service and restoration efforts. As the Sky Clears…. 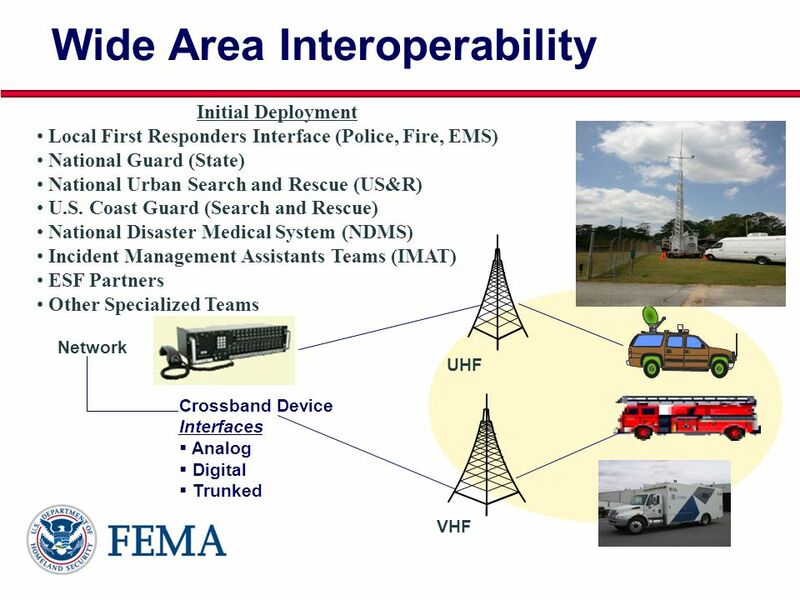 Converge assets into primary staging area Power outages critical factor Debris cleanup, tree removal, off for safety Evaluate resource needs Access Coordinate with government - restricted areas Curfews Fuel Security ACCESS - FUEL - SECURITY Power outages potentially grow due to accidental damage during debris removal, tree removal, fuel supply running out, and potentially for safety reasons where there are gas leaks or lines on the ground. 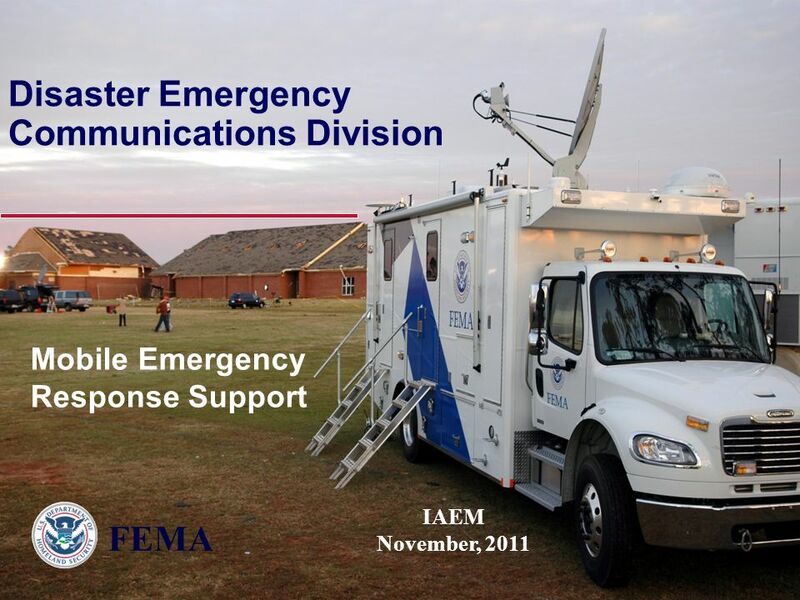 Restoration crews will gather in centralized areas to stage assets, supplies, and staff. 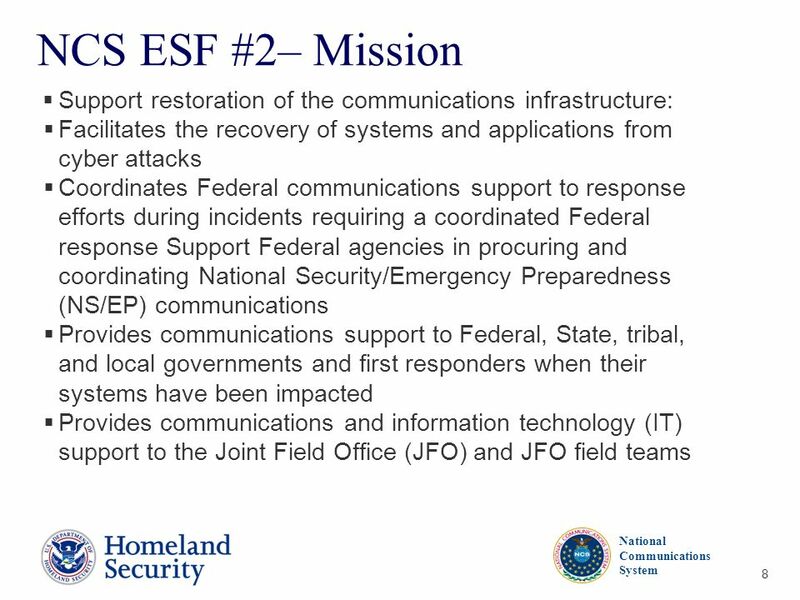 Government can help with Access to the site by authorized staff, access for getting Fuel to the site, assistance with getting to and from repair sites during curfews maximizing available time for repairs. 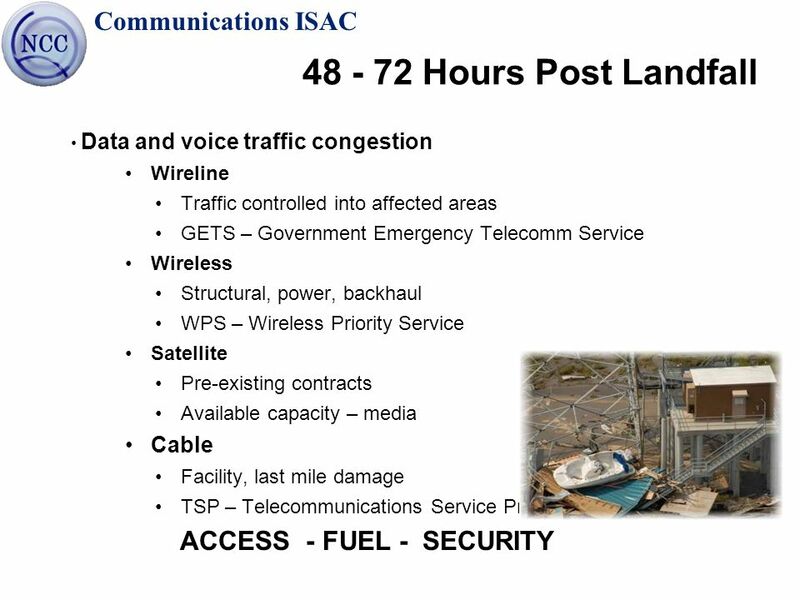 Hours Post Landfall Data and voice traffic congestion Wireline Traffic controlled into affected areas GETS – Government Emergency Telecomm Service Wireless Structural, power, backhaul WPS – Wireless Priority Service Satellite Pre-existing contracts Available capacity – media Cable Facility, last mile damage TSP – Telecommunications Service Priority ACCESS - FUEL - SECURITY Network traffic may be impacted by outages and increased volume, requiring management techniques to be utilized for traffic into affected areas. 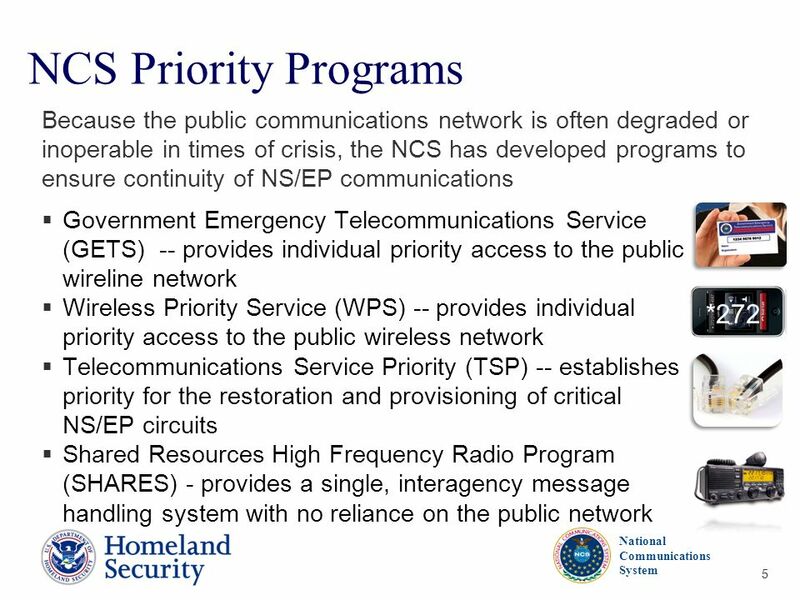 Utilizing priority processes/products – GETS and WPS – are available and should be utilized. 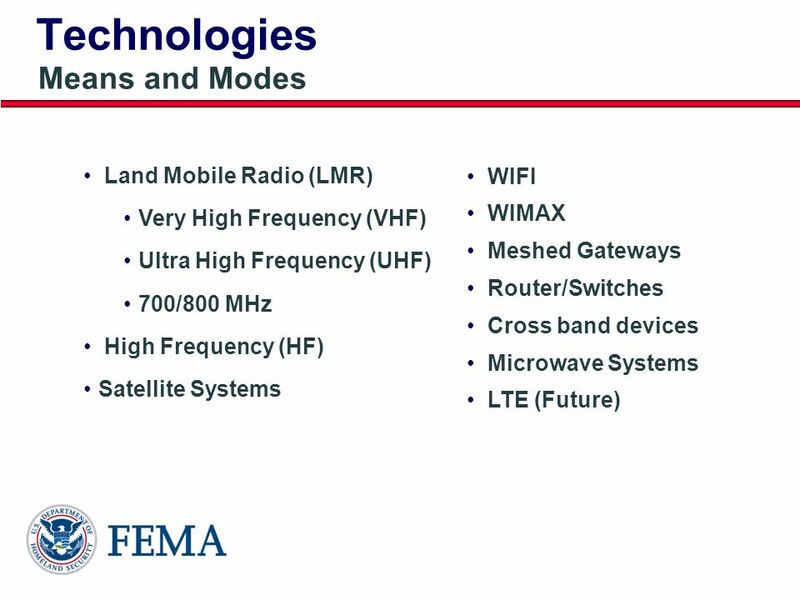 Satellite traffic with pre-existing contracts should be unaffected, unless physical damage to ground assets is encountered. 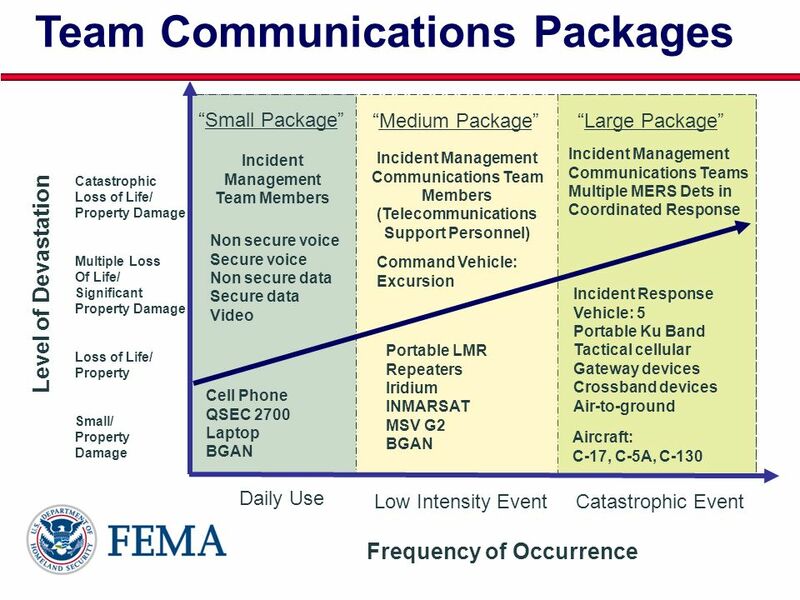 Incremental satellite use typically is consumed quickly by the media. 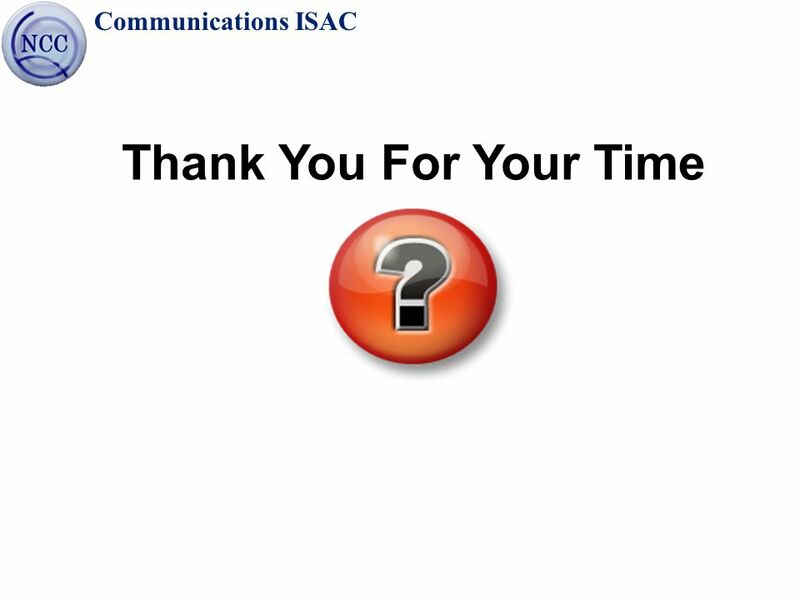 Cable – TSP – Cable, Wireline and wireless – priority services – preferential treatment to add new lines or have lines restored. 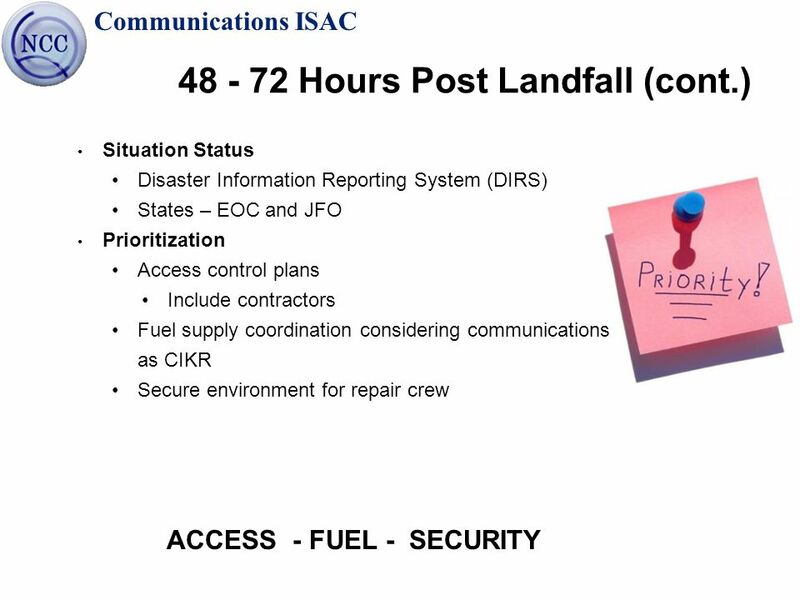 Situation Status Disaster Information Reporting System (DIRS) States – EOC and JFO Prioritization Access control plans Include contractors Fuel supply coordination considering communications as CIKR Secure environment for repair crew ACCESS - FUEL - SECURITY Information on availability and restoration will flow through existing processes – e.g. DIRS. 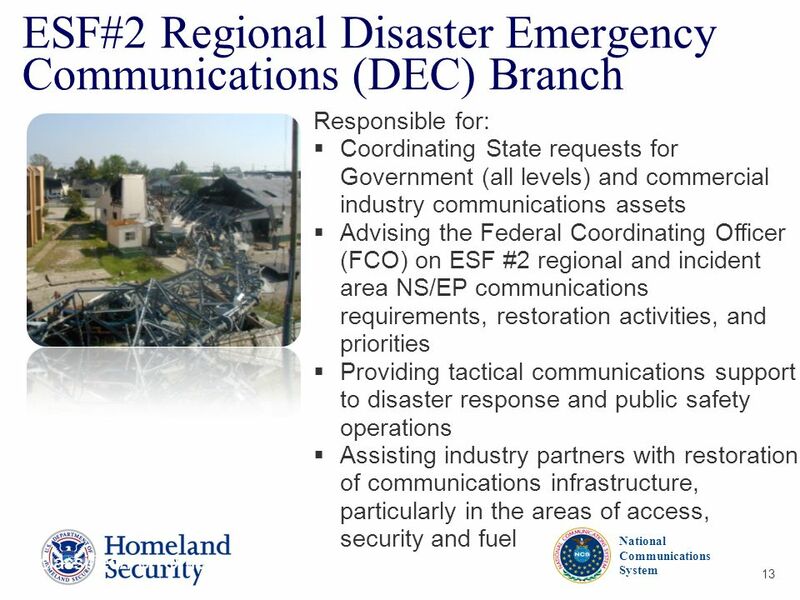 States utilize the Emergency Operations Center and Joint Field Office for information and coordination Access for restoration crew very important Credential acceptance by access control bodies Not just badged employees, also authorized 3rd parties Consistency Curfews Fuel trucks granted priority access. 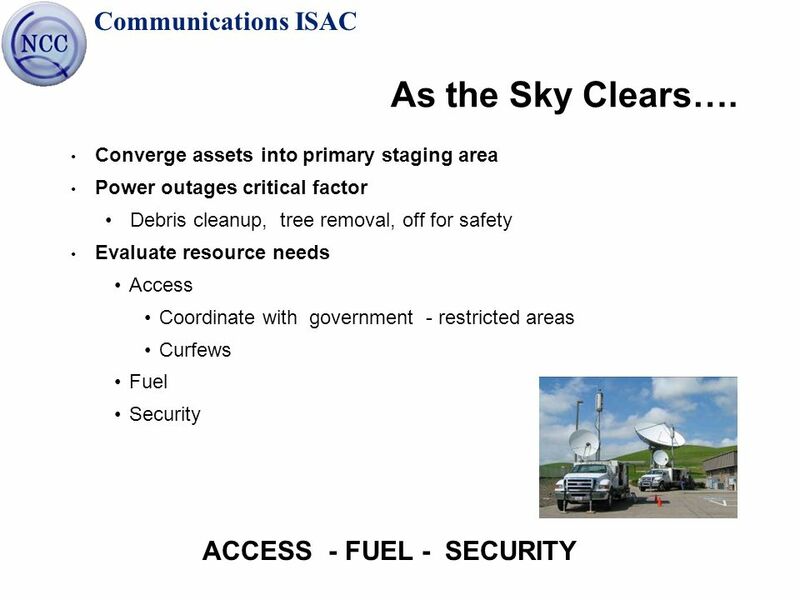 Long term- if fuel supplies become constrained communications need consideration as a CIKR. 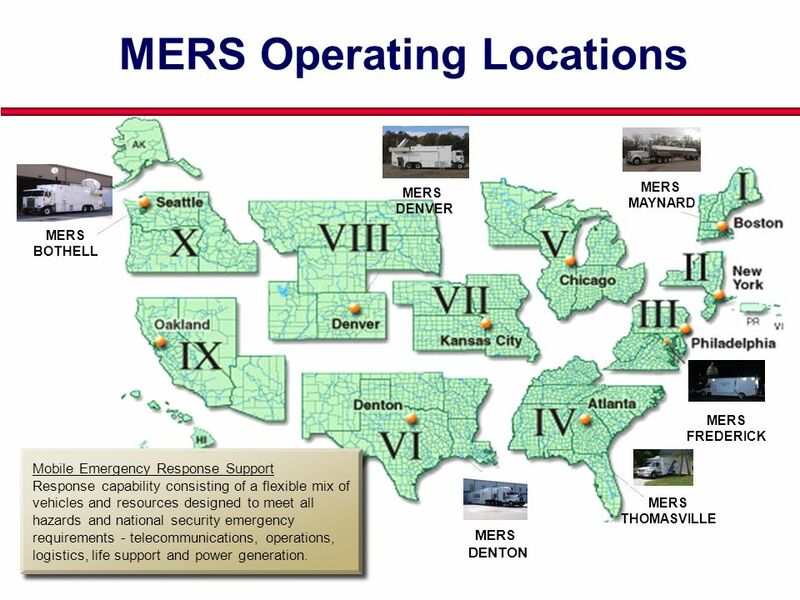 Secure environment for repair personnel so they can complete work. 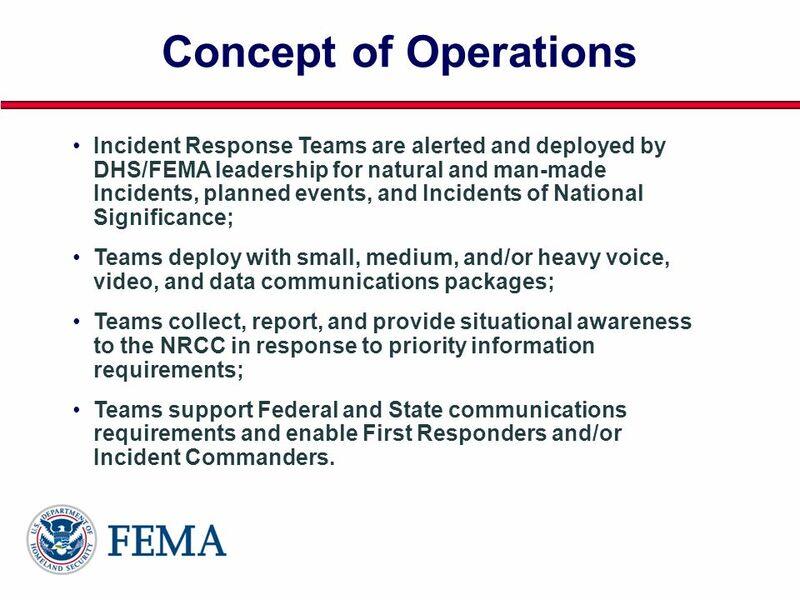 28 Concept of Operations Incident Response Teams are alerted and deployed by DHS/FEMA leadership for natural and man-made Incidents, planned events, and Incidents of National Significance; Teams deploy with small, medium, and/or heavy voice, video, and data communications packages; Teams collect, report, and provide situational awareness to the NRCC in response to priority information requirements; Teams support Federal and State communications requirements and enable First Responders and/or Incident Commanders. 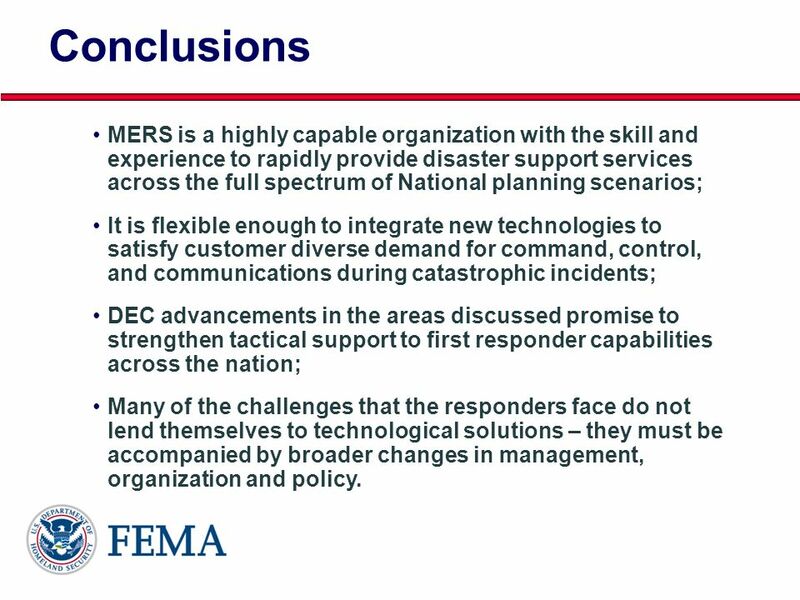 33 Conclusions MERS is a highly capable organization with the skill and experience to rapidly provide disaster support services across the full spectrum of National planning scenarios; It is flexible enough to integrate new technologies to satisfy customer diverse demand for command, control, and communications during catastrophic incidents; DEC advancements in the areas discussed promise to strengthen tactical support to first responder capabilities across the nation; Many of the challenges that the responders face do not lend themselves to technological solutions – they must be accompanied by broader changes in management, organization and policy. 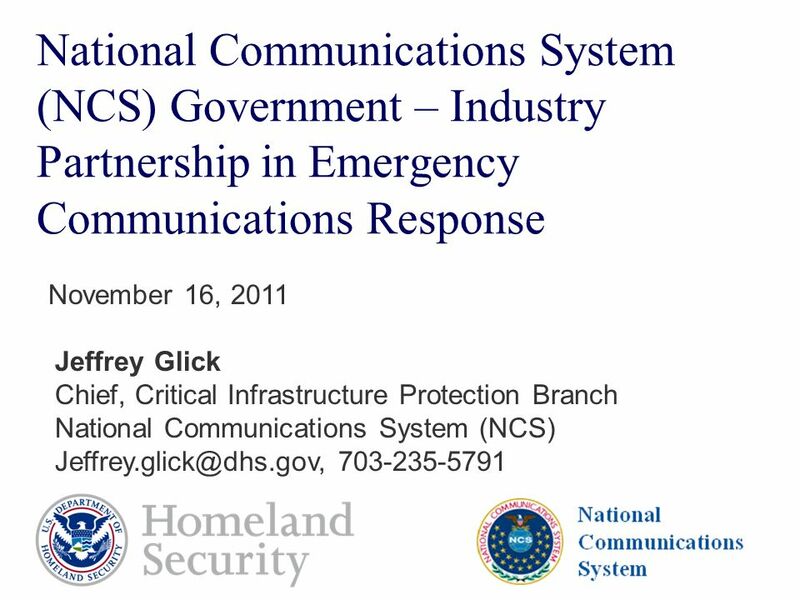 Download ppt "National Communications System (NCS) Government – Industry Partnership in Emergency Communications Response November 16, 2011 Jeffrey Glick Chief, Critical." 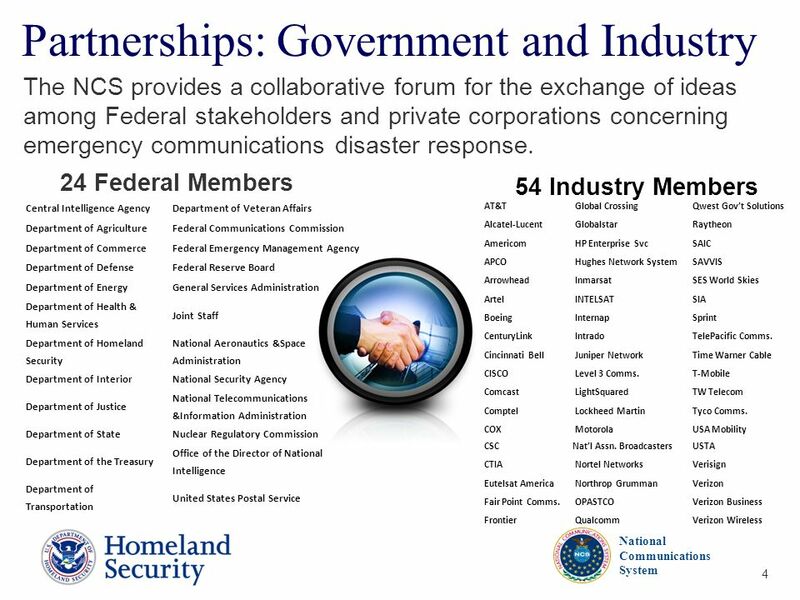 Homeland Security at the FCC July 10, FCCs Homeland Security Focus Interagency Partnerships Industry Partnerships Infrastructure Protection Communications. 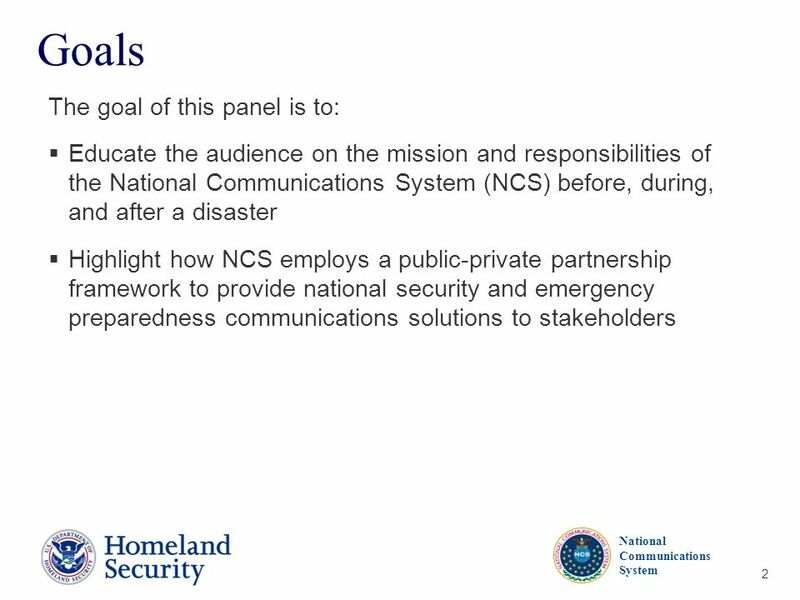 Communications Disaster Preparedness: Bureau Overview and Priority Services Tim Peterson Chief of Staff Public Safety & Homeland Security Bureau Federal. 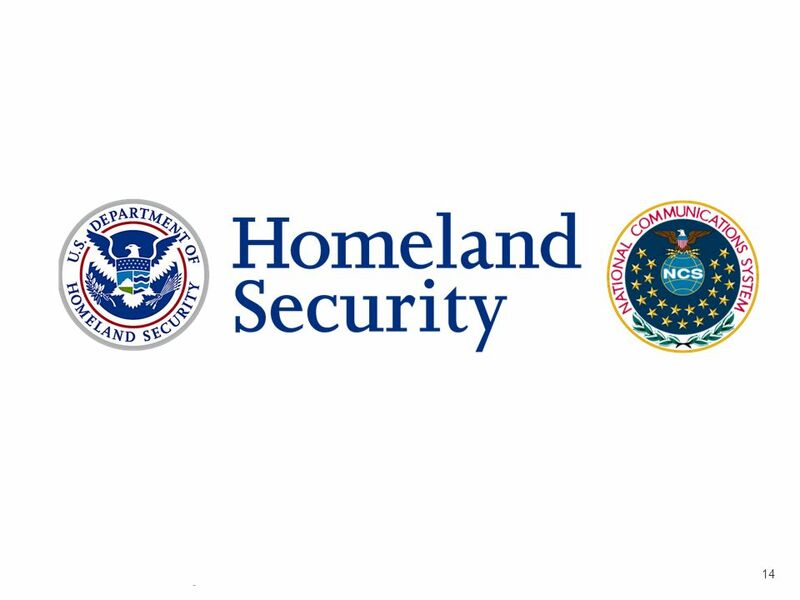 National Incident Management System (NIMS)  Part of Homeland Security Presidential Directive-5, February 28,  Campuses must be NIMS compliant in. 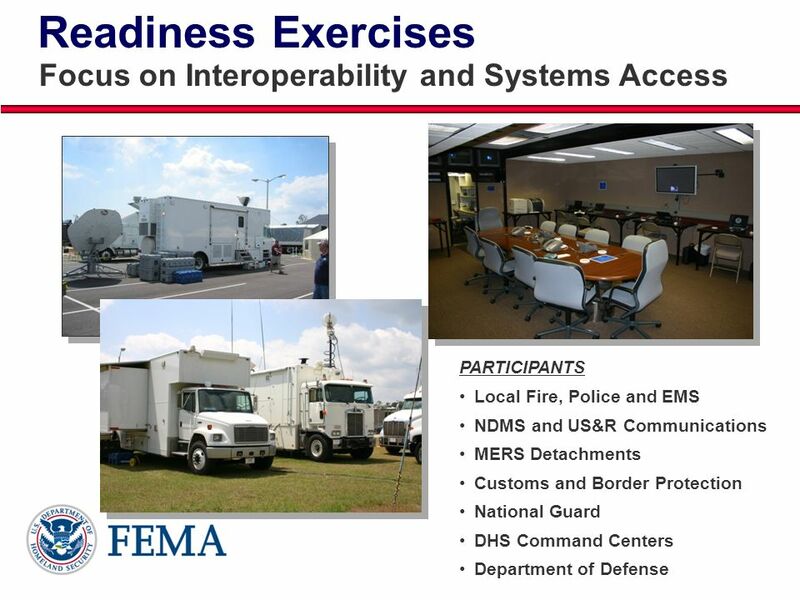 Bridging the Gaps: Public Health and Radiation Emergency Preparedness Mr. James Kish, Director Technological Hazards National Preparedness Directorate. 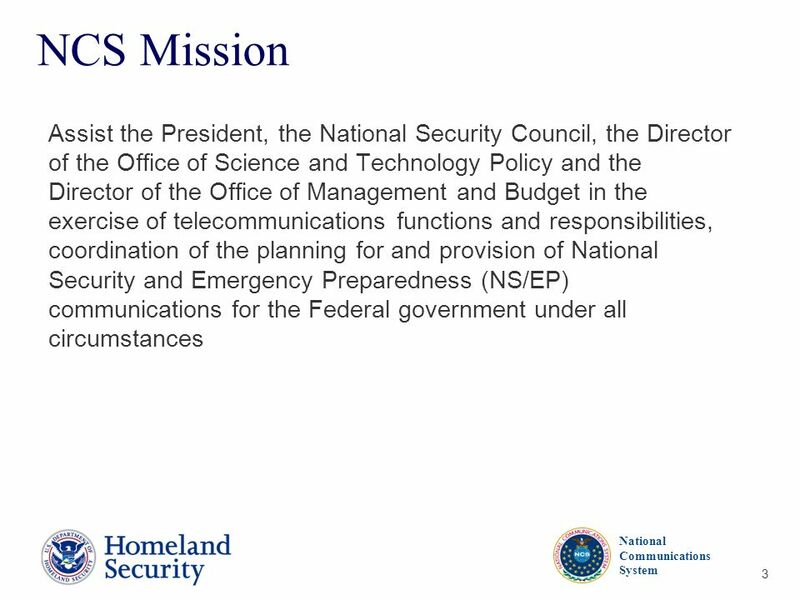 National Space-Based Positioning, Navigation, and Timing (PNT) Federal Advisory Board DHS Challenges & Opportunities Captain Curtis Dubay, P.E. Department. 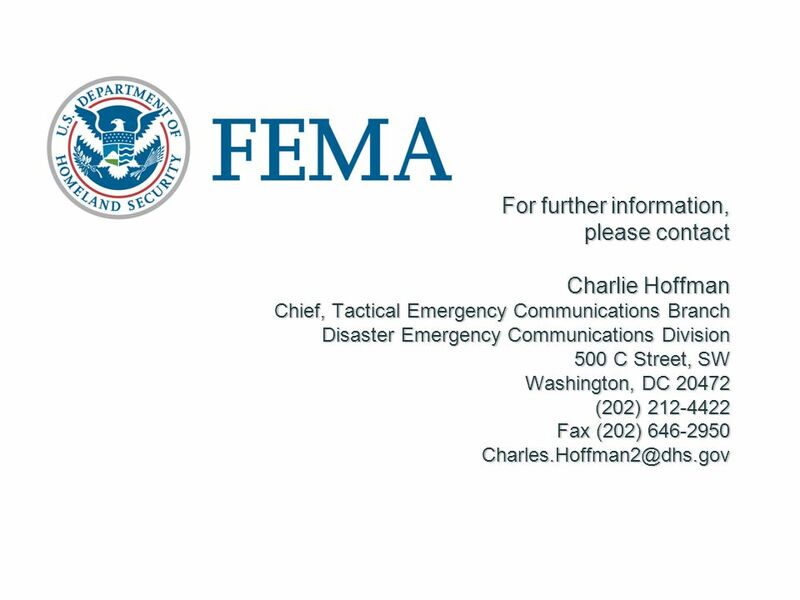 Federal Emergency Management Agency. 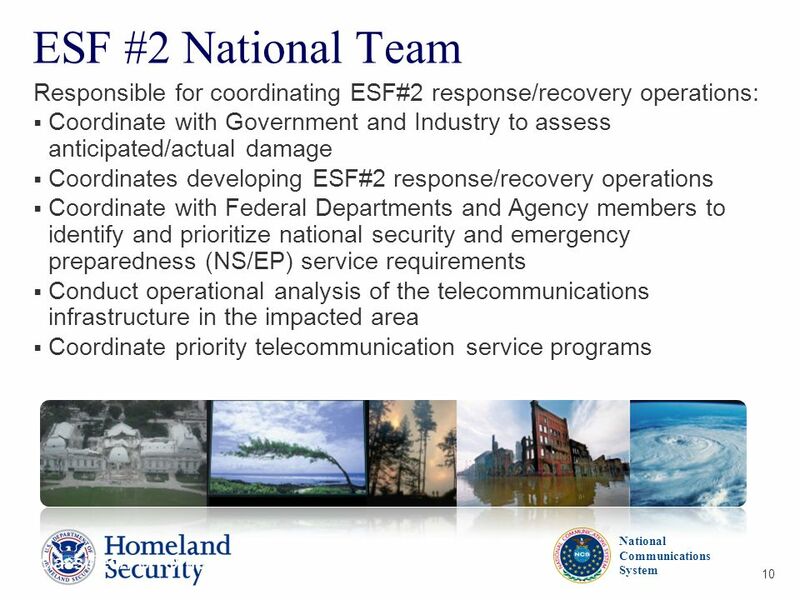 2 2 Emergency Response Assets/Teams Incident Management Assistance Teams (IMAT) Emergency Response Team-Advanced. 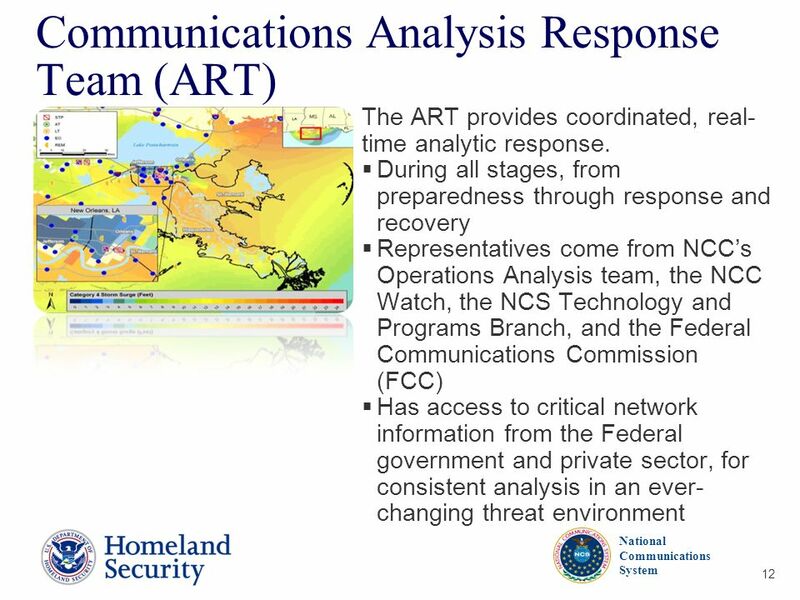 6/9/2015 MARYLAND EMERGENCY MANAGEMENT AGENCY. 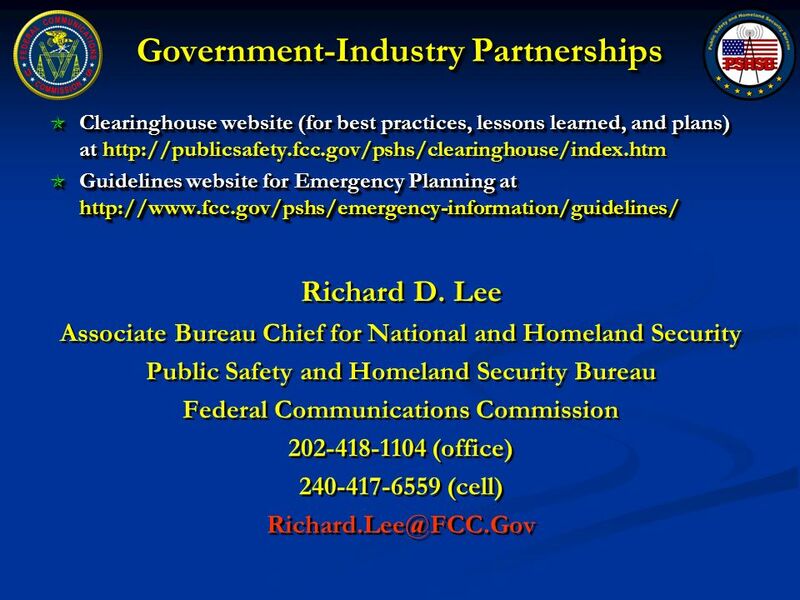 6/9/2015 The Maryland Emergency Management Agency Richard Muth, Executive Director Richard Muth, Executive. 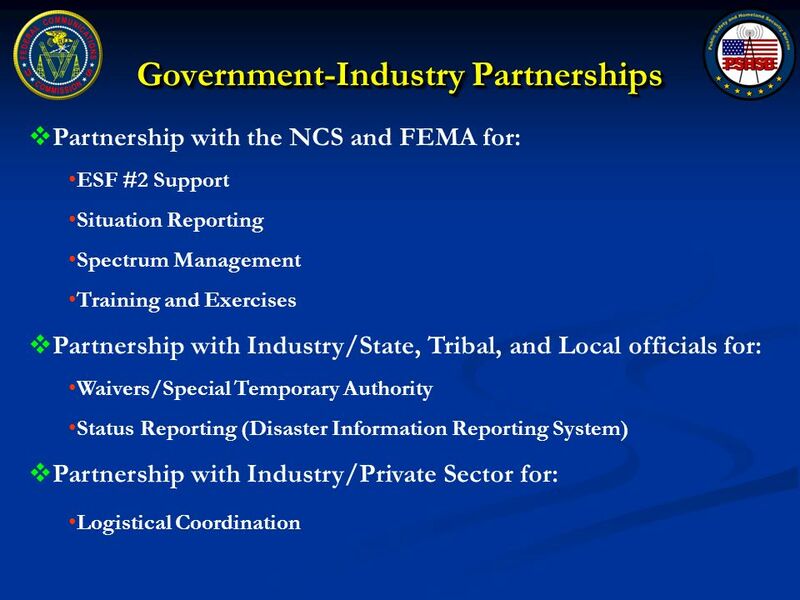 1 The “New FEMA” The National Logistics Coordination Forum March 27, 2008 Eric Smith Assistant Administrator Logistics Management Directorate FEMA LOGISTICS.